Why deal with pulling along a clunky suitcase anymore, especially when a travel backpack can fit everything you need and is super comfortable to wear. The key is finding the best travel backpack for the type of travel you do. There isn’t a one-size-fits-all. The best travel backpack is versatile and easy to carry, and conveniently fits all the stuff you need to carry without becoming cumbersome or disorganized. With airline checked luggage rules becoming super stringent and expensive, it’s more important than ever to invest in a sturdy and durable travel backpack as your only luggage. 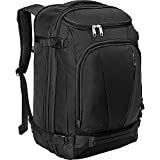 Iâm talking about a high quality backpack that is made for travel, has all the right features and can protect both your belongings and any valuables you place inside. 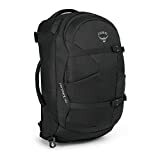 Below you will find Savored Journeys’ guide to choosingÂ the best travel backpacks 2019 to make the agonizing chore of finding the best backpack for travel an easy one for you. See all of our travel gear reviews. In case you don’t have a lot of time to read all of the reviews below and you’re just looking for a list of the top travel backpacks, take a look at our top picks. If these don`t suit you, scroll down to see our full list of recommended backpacks. If youâre a suitcase traveler, I know it will be difficult to get you to change your mind, but I think you might if you see all of the great benefits of carrying a backpack. I think some people find comfort in pulling along their stuff. But for those of you who are looking for a different, and better, way to pack, it doesn’t get more convenient than using a top rated backpack for travel. The moment I decided to switch from a suitcase to a backpack was when I was lost in Belgrade, trying to find my hotel, all the while pulling my wheeled suitcase along the cobblestone streets. It was a lot more struggling and yanking than pulling. I couldn’t help but lament how much easier it would have been if I was just carrying a backpack instead. You might think that carrying a backpack is just trading off the struggle of pulling for the weight of a heavy pack, but I don’t find that to be the case. With a well-constructed backpack, the weight is evenly distributed among your back, shoulders and stomach muscles. Of course you feel the weight, but carrying 20 pounds on your back in a well-built travel backpack is nothing. Don’t get me wrong, a bad backpack can feel like a boulder strapped to your back. But we would never recommend one like that on Savored Journeys. Check out our guide to finding the best carry-on backpack for your travels. Another common reason suitcase users don’t want to switch to a backpack is that they aren’t big enough. I will concede that if you’re using larger than a 25″ suitcase, a backpack is not for you. I fit everything I needed for a 60-day trip to Spain in a 25″ suitcase. That’s a LOT of stuff. You aren’t a light packer, and there’s nothing I can do for you. But if you typically use a carry-on size suitcase, there is an equivalent sized backpack that can fit just as much stuff, and can also be squished inside the baggage sizer at the airport so you can get away with just a little more. A 44L travel backpack, like the one we reviewed by Cabin Zero, is the perfect substitute as a carry-on backpack. TravelPro Maxlite 4, isÂ 21 x 14 x 9 inches and weighs 7 lbs. The Cabin Zero bag is 21 x 15 x 8 inches, but it only weighs 1.5 lbs. If you use a largerÂ suitcase, you just need a large travel backpack instead. Take for instance the very popularÂ Osprey Farpoint 70 Travel Backpack. At 26 x 13 x 13 inches, it’s as big as a typical 25″ suitcase, especially when you take into account the backpack doesn’t have bulky sides and wheels. Just keep in mind, a 70L backpack will be heavy to carry. â See more about the Osprey Farpoint 70 large travelÂ backpack below. Travel backpacks come in many different shapes and sizes. There’s not a one-size-fits-all backpack I can recommend that will meet everyone’s needs. To make the selection process easier, I’ve broken the top backpacks out into categories, below. Take a minute to think about what you need in a backpack before you dive in. Which type of travel backpack areÂ you looking for? You can browse them all, or use the links below to jump to the one you need. You will find a review of the best backpack brands and styles below for each category. These are based on my opinion and the customer ratings from five different online stores that stock these top backpack brands. In this section, when we talk about carry-on backpacks, we’re referring to a small backpack that can be used for a short trip or as an extra bag to hold your day essentials.Â If you’re looking for a carry on backpack that can replace a suitcase but fits airline regulations to be taken on the plane as a carry-on item, you’ll typically want a medium-size backpack or larger. As a small carry on backpack, the Saxon suits just about any need.Â It’s a convenient size for taking on an airplane or train to carry all your entertainment options, plus a change of clothes, in case your luggage gets delayed. There is one large main compartment that will fit a large-size packing cube, a brush and a pair of shoes. There’s a a rather large front-panel pocket with internal organizers for everything else.Â Â There’s also a top zippered pouch that has a soft lining so your phone or sunglasses can be stowed without the possibility of being scratched. The size of some large travel backpacks will blow you away.Â You can buy an 80L backpack, you just won’t want to carry it once you’ve got it all packed up. I personally draw the line at a 44L backpack, because the weight it can hold is about all I want to carry, but if you’re looking for a large travel backpack, you’ll be happy to see there are many choices. Some travel requires more space for everything you need along the way, especially when the trip includes multiple destinations. That’s where the eBags TLS Mother Lode comes in handy. If you need space, this is the backpack to do it. It has a total capacity of 56L when using the extension. Without the extension, the dimensions areÂ 22″ X 14″ X 9″, which is carry-on regulation size for some airlines, but not all. You can carry the bag as a backpack or a shoulder bag. You can hide away the shoulder straps so they won’t get caught on something as they move along the luggage belt, one of my favorite features of this backpack. The large main compartment, which can be divided into two, can hold way more than you might think. The only consideration is too make sure you don’t fill it too full because it can be really heavy. For comfort, it has a padded air-mesh back panel and removable, adjustable sternum strap.Â There’s an second internal zippered pocket to store larger items like a Kindle, books and brochures. It also holds up to a 19″ laptop in a secure harness. eBags is a popular luggage brand and they have almost any size you could ever need. If this 56L backpack is too large (or not large enough) check out the 25L Junior Mother Lode. Traveling in Europe is a unique experience that is unlike traveling in other areas because of the propensity to hop around frequently from country to country. You need a backpack that will be flexible and useful enough for many different situations, whether that’s taking a quick flight on Ryanair, packing into a very full subway train, or traveling on an overnight bus. You don’t want to be bogged down with heavy luggage that’s hard to pull on cobblestone streets, and you don’t want a backpack that’s too small to fit all the essentials you may need for a couple weeks or months. 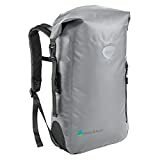 If you’re an economical packer and you choose what you need to pack smartly, the Osprey Farpoint 40 backpack is a really great choice for a Europe backpacking trip. There are a few main concerns your backpack needs to address. If you’re going to fly, you don’t want to pay twice or three times as much for your ticket just because your luggage is too large. If you’re going to take the subway, you don’t want to constantly be bumping into people with your pack, and since there will be a lot of walking involved, you need a pack that is lightweight and easy to carry. The Osprey Farpoint 40 meets all of those needs. First of all, the art of packing for Europe is different than other locations, if you’re going to be staying for an extended period of time. You want to pack the right combination of clothing and layers to provide the greatest versatility, and remember that you’ll be able to wash your clothes along the way. The Farpoint 40 has plenty of room in the large interior pocket for a clothing and extra pair of shoes. There’s also an internal zipper pocket that can be used to hold toiletry items. The exterior pocket can be used for smaller items you need to get to quickly, like passports, electronics and camera. The Osprey 40L can hold around 20 pounds worth of stuff, but the back panel, padded shoulder straps, hip belt and harness system will help distribute the weight. The backpack has two padded handles, on the top and one the side. When it comes to safety, you always want to keep at least the main compartment of your backpack locked when it’s not in use. The Osprey’s zippers have loops so you can lock them together. The bag also has dual compression straps to firmly hold in the load and protect against theft while it’s being worn. Some backpacks are already heavy before you even put a single thing inside. Take for instance the wheeled backpack listed below. That sucker is 6.5 pounds all by itself! Why make the load heavier to carry than it needs to be? A super lightweight backpack can cut pounds off the total, and I don’t know about you, but that sounds really good. The Cabin Zero backpacks are ultra lightweight. The 44L backpack weighs only 1.7 pounds. That’s really astoundingly light. There’s a 28L version that’s only 1.3 pounds. Even the 44L version is airline-approved carry on size, so you can use it as your go-to carry on bag for travel. I also really like the design and structure of the Cabin Zero backpack. Itâs got aÂ boxy style that is perfect for use with packing cubes. Two large packing cubes fit perfectly inside the bag with space at head for other things like a pair of shoes or folded rain jackets. If you’re sick of having to yank on the contents of your bag to get it out of the small opening, you will love this bag. They’ve made the main compartment open almost all the way, so itâs easy to get things in and out without a struggle. Itâs made with a thick waterproof polyester material that feels very durable, has thick-padded shoulder straps, a full lining to protect the inside, heavy-duty lockable zippers, and reinforced stitching. Whatâs not to like? Right! If you regularly carry your laptop with you while traveling, it’s just smart to find the proper backpack for it. It doesn’t take much to rattle a computer. The last thing I want is to accidentally drop my bag and break my computer. Travel laptop bags have also gotten a security boost recently. Some are even TSA approved to go through the scanner with the computer still inside. Check out our list of the top travel laptops. There are many things to like about this SwissGear ScanSmart backpack. The main feature of this backpack is the dedicated laptop section that allows you to pass through security screening at the airport without taking the laptop out of the bag. You can unzip the back section and lay it open flat on the scanner and it will pass right through with no worries,Â as long as the laptop is the only thing you’ve packed into the back section. It fits up to a 17″ laptop in the back pocket, that has a side zipper, so you don’t have to open the main compartment to pull out the laptop. There is also a dedicated tablet pocket opposite the laptop section with a protective sleeve to keep your tablet safe. The SwissGear computer backpack has padded, ergonomically contoured straps that conform to your back, so it doesn’t dig in, even when it’s packed full. The back panel is nicely padded and has a ventilation technology to keep your back from overheating. It also has a sturdyÂ handle that helps distribute the weight when carrying it by hand. It might look like a small bag from the images, but it can hold up to 31L. 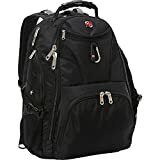 For me, that will easily accommodate clothing and accessories for a 5-7 day trip.Â For travel purposes, it has plenty organizational features and pockets, and it can double as a work/office bag, too. There are multiple interior pockets for accessories, including a padded pocket with a headphone slot so you can store your phone or ipod and listen to music while on the go. Additional features that are nice to have are the side water bottle pocket, which I prefer to use for my travel umbrella, and the carabineer so you can attach things to the outside (like an extra pair of shoes!). If you’re on the fence about a backpack because you don’t always want to be carrying that much weight around, and you like to have the flexibility to pull it like a regular suitcase when the situation calls for it, you might want to consider a rollingÂ backpack. Many of the best travel backpacks with wheels are streamlined and light, so you won’t be bothered by the extra weight the wheels add, but it definitely will be bulkier and heftier than a regular backpack. The top thing you should consider with a wheeled backpack is how well the telescoping handle can be hidden and whether that mechanism will be bothersome while carrying the backpack. The High Sierra wheeled backpack has a single-tube telescoping arm that retracts into a protected zippered compartment. When pushed in, you can’t see anything but the wheels. The padded shoulder straps are also hidden behind the back zippered panel so they don’t get in the way when pulling the backpack. Speaking of the wheels, they are fairly sturdy all-terrain wheels in a corner-mounted housing to protect against wear and tear. They don’t feel wobbly or cause the bag to waver when being pulled. It can become top heavy and tip over if the stuff inside isn’t organized properly. High Sierra Powerglide Wheeled Backpack. Aside from size, this bag also has a dual-tube telescoping handle that makes it even more sturdy on its wheels than the Freewheel version. The only thing this bag really lacks is additional comfort features in the back. Many backpacks have a firm back panel with air ventilation, but this backpack does not, due to the wheel mechanism. If that’s a drawback for you, I don’t think you’ll find a wheeled backpack with a different style back. It’s just not possible for it to offer the same level of comfort as a traditional backpack. The polyester material is durable and has a water-resistant coating to repel water. It also has reflective features for safety at night. It comes with aÂ limited five-year manufacturer’s warranty. If you live in a rainy city, like Seattle or London, or if you’re an outdoor adventurer, you might be looking specifically for a backpack that is waterproof and can protect your stuff from water. Most backpacks have some degree of water resistance, but if you need more assurance than that, you’ll want to find one that is guaranteed to be waterproof. One of the best waterproof backpacks we’ve seen is the BackSak. It’s made withÂ vinyl-coated woven polyester and has watertight welded seams to keep it completely waterproof, even if you were to accidentally immerse it in water. You can take it on a sailboat or even rafting and feel confident that it won’t get wet inside the main compartment. There is an outer zipper pocket that is called “splash proof” but it’s not technically waterproof, so you wouldn’t want to put anything in that pocket that you don’t want to get wet. The bag’s 35L size is great for longer trips, but isn’t too large to feel bulky or unnecessary. The interior of the bag has one large compartment where you’ll want to keep everything you don’t want to get wet. You can close the bag in two different ways, by rolling the top down a few times and securing it with the top clip, which forms a handle for the bag at the top, or you can clip it to the sides to form a tightly bundled pack. The BackSak has a lot of other features that make it comfortable to wear, like the padded back and adjustable, cushioned straps. It has reflective trim to keep you visible in night situations. There are also a fewÂ rings at the sides to clip on a water bottle and other gear. Hopefully I didn’t overwhelm you with all of these travel backpack choices. There are so many different types to choose from. If you can narrow it down to a specific category, then this list of the best in each category should really be useful. If you have any other backpack or packing questions, feel free to ask! What is your favorite travel backpack? Share it with us in the comments. Need a backpack for travel? Find the best travel backpack for your needs here! This entry was posted in Reviews and tagged luggage. I just bought Rick Steves travel bag that converts into a backpack. after research. After several trips, so far I am happy with it. Instead of the packing cubes he recommends with it, I use an accordian-like collapsible lightwight hanging shelf for structure when I am packing dress clothes, suits, etc.. I am curious why it is not reviewed here, or on other “top backpack” lists for 2017. I haven’t had a chance to try that bag, David. I’ll definitely put it on my list to review. The hanging shelf structure sounds interesting. What do you recommend for a family of 5 (three girls 11, 9 and 6) for two weeks in Europe. We are stayin at a home there. My husband does not want us to check luggage (maybe one huge bag). I (as mom) want to get a luggage backpack for me: but then do I bring a cross body purse for sight seeing? What about the kids? Just have them brin school backpacks? Hi Rebecca. I think it would be quite difficult to only use carry on backpacks for 5 for 2 weeks. You could do it, but it would be tight. Two 40-litre bags packed wisely might be enough, (Kelty redwing or Osprey 40) but you have to be very careful to check the weight. For one checked case, the Samsonite Omni spinner 28″ is a great choice (packed wisely would be enough room for 5), then you could add a Redwing or Enterprise 33 for yourself (with things you need to keep handy). I always travel with my Enterprise 33 and a crossbody bag. Check out the first 4 on our travel purse guide. They are large enough for all the basics. The kids could just take regular backpacks, either with some of their clothing, or just entertianment/ essentials. If you’re a wise packer, you can do it with a large suitcase and a 33-40 liter backpack.